The new Borrego is Kia's answer to the Nissan Pathfinder. Like the Pathfinder, the mid-sized Borrego is body-on-frame and virtually identical in size. Two engines are offered: a 3.8L V6 and a 4.6L V8. The V8 is a first for Kia. Borrego can tow 5000 pounds with the V6, and up to 7500 pounds with the V8. Three rows of seating are standard providing seating for seven passengers. The second row slides fore/aft to negotiate legroom. Notable features include a 600-watt Infinity audio system, a DVD navigation system and a backup camera. The new mid-sized Borrego is a body-on-frame SUV with V6 and optional V8 power capable of towing up to 7500 pounds. 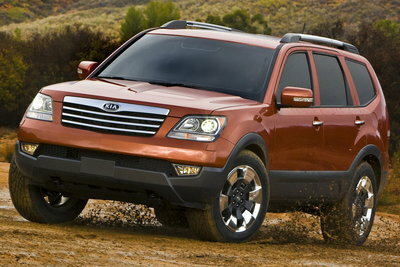 The 4.6L V8 is the first V8 for Kia. Three rows of seats accommodate up to seven passengers.